Okay, some things are a bigger priority than others. I don’t have to spend all my money at once. We need blinds for the front rooms. We’ll need eight sets, I think. Something for the front door as well. Do we need them for the den, too? Maybe. Especially since anyone driving down the alley can see into the house. We need these for both the front and the back of the house. Since I’ll be there by myself, I really think these are essential. Even if I don’t even know where to get them or how to put them in. Guess I need to talk to the handyman and see if he can do those. Wood floors in the living room. Where would the wood floors end? Probably right where the carpet ends now going toward the offices and the kitchen. The other direction I don’t know where the carpet ends. Perhaps at the wall that the hall closet is on? How could we make it end well there? The kitchen in the house is black. (R and I think it might be French Black, the black with a lot of green in it.) It has raised panel outsides on the cabinets and the handles appear to be silver or brushed nickel. Hard to tell from the pictures and I don’t remember. Do we want a kitchen island that is wood or black? Sears appears to carry (online at least) the most stackable washer and dryer combinations. I like the Kenmore’s but wish they were silver. Also need a dishwasher. If we put it back in where it was and add in a pantry where the fridge is now and move the fridge over, then the fridge isn’t right next to the dishwasher, which is not energy efficient. We do want a door put back in to the offices. We want one door there. I would prefer a wooden door. It could be an inside door or a pretty door, maybe one with a window at the top? Perhaps we could match the front door? Would we want that? The fireplace has obviously got issues with popping embers. (The floor is burnt.) What if I put in a cool craftsman style fireplace door? 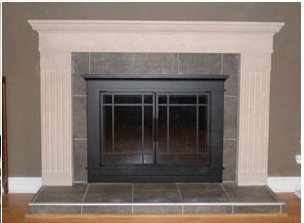 Found one: Pleasant Hearth Glass Fireplace Door Easton Black. The one I like is $349.00 in all three sizes. The site tells how to measure. They won’t fit if the opening is too small or too large. But it looks like my fireplace isn’t too large. Might want to get one for the office too. I would like to add shelves in under and over the counter instead of where the kitchen desk area is now. We could put the appliances that are nicer looking there. I think that might work well. Put the heavier ones higher up and the lighter ones lower down. Maybe even put in a lazy-susan. Pantry. Either put it on one side of the refrigerator or put it in on the other side of the room. On the other side of the room I would make it as deep as the counters all the way up with doors that open. We could put in a six foot pantry. Basically standard cabinets appear to be 24 inches deep and 36 inches high. So if we put in a 6 ft wide x 2 ft deep x 8 ft high = 96 feet of space. That would be nice. It would still leave a little bit of space at the wall for the light fixtures. Do I want doors there? Well, there is a door there, to the den. Do I want a door to the kitchen? That doesn’t really make a lot of sense, to cut off the pathway… Except that it would be nice to be able to close off the laundry room if you were in the front of the house and not hear it. I’ll have to think about that. The hearth on the living room fireplace matches the brick in the office fireplace, but not the brick in the living room fireplace. What else could we put there instead? Could we paint it? What color? Make sure you have chosen a color that will withstand changes in decor, as removing the paint is difficult and time consuming once the brick is painted. It doesn’t look like I should paint. Paint is hard to remove and dates easily. What if I just extended the fireplace hearth and put wood underneath it? So the fireplace hearth is wider (so the floor won’t burn any more!) and then underneath that sticking out part is wood. Would that work? How wide should it be? I have been using the rule of fireboxes level with the floor must have at least an 13″ hearth extension to a non-combustible material and those above floor level must be at least 18″. I saw that documented 5 or 6 years ago. I was looking through the Code Check Complete book and found a totally different rule for hearth extensions. On page 47, it says 16″ minimum hearth extension if firebox opening is less than 6 sq ft.
20″ minimum hearth extension if firebox opening is greater than 6 sq ft. The difference being the rule I have been using deals with height of the firebox to determine depth of hearth extension whereas the Code Check documentation has it determined by sq ft opening of the firebox. A nice marble or granite slab, with wood underneath, would look good. Could I find one that “goes” with the brick without being totally ugly? Maybe not. Obviously that’s not a priority. 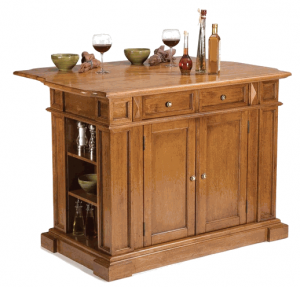 Where am I going to put my china cabinet? Mom’s really goes with the style of the house better, but I’m not taking Mom’s china cabinet without Dad offering it. And I’m not sure where I can put mine. Perhaps move the fridge over and put the china cabinet there? I don’t want the moisture of the dishwasher getting to it, either, though. I may have to think about this. R wants to take our old refrigerator. Where would we put it? I don’t want it in the utility room, at least not where the washer and dryer are now. However, if it would fit on the wall next to the bathroom wall, either where the mirror is now or facing like the stackable washer and dryer… It is NOT going into the room and then blocking the door like the washer and dryer do. Yeah, it’s only a few inches, but that’s too many.